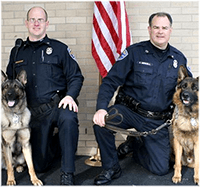 From April 25th: Photos of RPD's finest, including "Ram, along with his handler Officer Matt Balch, is on the left in the picture and Ian along with his handler, Officer Kevin Miskell, is on the right." "Her hair was up in a ponytail, her favorite dress tied with a bow. and he surprised me with pink roses, and taught me to fly a kite. when a roadside bomb hit his convoy and taught the world to fear. Dedicated to the children whose parents will never make it home...."
Posted by Deborah Young and Juno from Juno's Place. The administrators of the page are quick to link and share stories from other departments honoring their first responders. The page has shared stories from the San Antonio PD, the Monroe County Sherriff’s Office, and the Waco Police Department Neighborhood Services Detectives pages among others. The mission for this community page is clear, "This page is dedicated to those who are devoted to public service! May God bless all of those who serve and protect us and keep us safe! Our first responders deserve our support!" For more information, and to "like" them on Facebook, visit their page here.